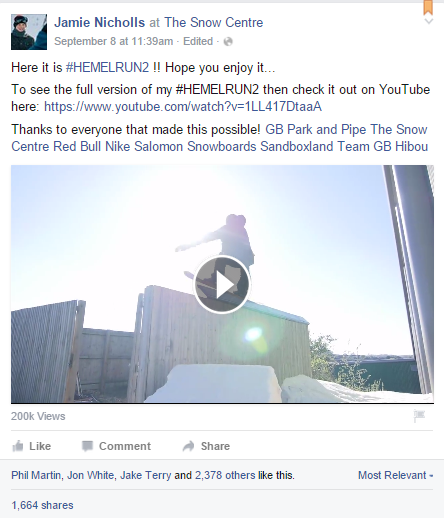 Should you post your video on Facebook or YouTube? This week Jamie Nicholls released his much-awaited ‘#hemelrun2’ – a super-inventive freestyle run filmed at The Snow Centre in Hemel Hempstead. What interests us is that Nicholls chose to upload the video to Facebook, rather than just share the YouTube film (although, confusingly, he did also link to it in his Facebook post). This means we can see how many times each different version has been viewed. The results are interesting. The Facebook version has gone viral with almost 2400 Likes and more than 1600 Shares. By 11 September, it had logged over 200,000 views. 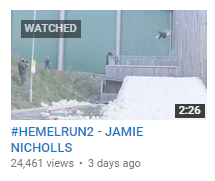 In contrast, the YouTube version, hosted on Jamie Nicholls’ channel has had just 24,461 views. It’s only been out for three days, so that’s still very good and is already higher than the 22,000 views on the previous run filmed last year. Ultimately doesn’t make a huge amount of difference – if someone views the video, then it boosts Nicholls’ profile, as well as adding value to the sponsors and partners who are featured within the video. However, if the YouTube video had been shared as part of a YouTube playlist, for example as shown below, then users would still be able to Like and Share on Facebook, but they would also be more likely to view more videos by Nicholls. They would also become subscribers to his YouTube channel – an important metric when negotiating with potential sponsors. The difference is not huge, but given the amount of effort that has gone into creating this superb video it makes sense to maximise the potential return.